Nonprofits like J/P Haitian Relief Organization, Artists for Peace and Justice and the Worldwide Orphans Foundation are proving that by aggressive fundraising, hiring the right experts, employing the local community and educating Haitians from the littlest kids to adults in everything from literacy to filmmaking and construction, they can make improvements in the nation where other aid organizations have failed. To date, J/P HRO has provided direct support to nearly 5,000 families to relocate from the Petionville Camp, and it’s helped more than 450 families move into earthquake-resistant housing. Today, the J/P HRO Engineering and Construction team continues to demolish and clear debris from damaged structures and has removed 1.3 million tons of rubble from the area. “The strategy now really is to teach the people how to build safely,” says Anna Calogero, J/P HRO’s Neighborhood Upgrading Project Manager and expert at alleviating slum conditions. Some of the heavier lifting that J/P HRO has had to do has been in convincing a skeptical community that with patience and cooperation, assistance can eventually come to all. The Worldwide Orphans Foundation, founded by pediatrician Jane Aronson and supported by, among others, Amy Poehler and Seth Meyers, also has tied aid to jobs, recruiting and training 137 community members, ages 17-35, in the principles of early childhood development, and employing them to run a program for 250 at-risk children. APJ has focused on the underpinnings of job growth. In a country where the unemployment rate is officially estimated to be around 40%, but in reality is closer to 75% when not factoring in the informal jobs that keep most of the population afloat, the future of young Haitians weighed heavily on Haggis’ mind even before the earthquake. 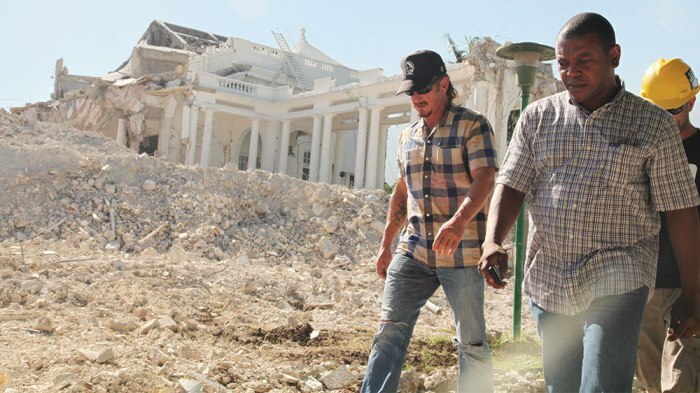 The Oscar-winning filmmaker first visited Haiti in 2008, when he met Father Rick Frechette, an American priest and doctor whose work with the St. Luke Foundation spans more than 20 years. Initially, Haggis helped fund some of the foundation’s primary schools, but after the quake, he and Frechette determined the greater need was for a secondary school. With the quake still on everyone’s minds, Haggis gathered a large group of friends into his backyard — among them actors Daniel Craig, Maria Bello, Olivia Wilde, Gerard Butler and Susan Sarandon — and in one afternoon they pledged to give $4.5 million over the next five years. As a result, APJ broke ground on a school the following April, determined to open it by the beginning of the school year. Using a Haitian architect, local contractors and engineers vetted by the St. Luke Foundation, the Academy for Peace and Justice opened its doors in October 2010 to 400 students. Today the school educates 2,300 tweens and teens from grades 7 to 11, with a goal to increase this number to 2,800 by 2016. None of this progress would be possible without trust established in an area known for extreme gang violence. While board members often make individual trips to Haiti, a large group of donors also visits the school approximately every three months. And beyond using their check-writing skills, APJ members like Ben Stiller and Wilde have been able to connect the organizations with corporations or foundations that are able to help the cause. In a place where even the college-educated have a hard time finding work, Haggis recognizes that giving kids a secondary education and sending them on their way is not enough. That is why APJ also runs an artists institute, comprising two technical colleges for film and for audio engineering, where they train 100 students a year. When asked why donors should continue to support Haiti, Bello, an APJ board member and founder of WeAdvanceU.org — a website that provides access to medical, social and legal services to Haitian women as well as video tutorials on health education and community-strengthening — says the work in Haiti is far from over. Bello, who has visited almost monthly for the past four years, says she is proud of what has been accomplished with the help of the creative community.